This week I Heart Faces theme is props. I don’t have much in the way of photo props, but I always like taking pictures at playgrounds for all their colorful equipment and the natural (not posed) expressions I can capture of the girls playing. So to me playgrounds equal lots of on location props! In essence, our prop is just a regular ‘ol swing. Great shot! Love swing shots!! I love your point of view! 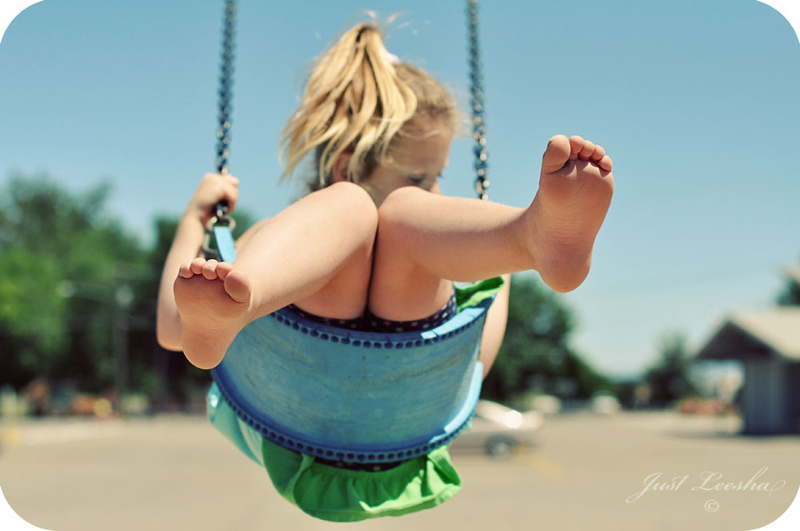 Yay for swings and summer! The focus is spot-on. Great capture. Some of the best props are not the fanciest 🙂 I love, LOVE the perspective of this shot. I like how it seems that your girl doesn’t even notice you’re taking a picture of her. She’s just enjoying the heck out of some summertime swinging’ 🙂 Nice shot, Leesha!